My Puppy has loose stools/the runs/has an upset stomach!! Firstly a disclaimer. This is NO substitute for vet advice. But it is written from many years of raising puppies, both litters and buying in from breeders so all the joys bringing home a new puppy brings. Some are extremely lucky, and rarely have the slightest problem with their pups tummy. Let me stress these folks are EXTREMELY lucky In which case move on as you are not in any danger of needing any of this advice – grin! I’m going to talk about a VERY common pattern of events. You bring your puppy home from the breeder. There are several ‘danger zones’ in terms of loose tummies. The first is IMMEDIATELY. the change of water, the excitement and upset in equal measures, the change of routine etc can certainly make the strongest puppy loose in motion. I’m not going to lie, there will be the odd puppy who will be sent home with its new owners WITH a loose stomach, so don’t immediately jump to the conclusion that *you have done something wrong* UNLESS you actually saw him/her poo solidly before you left the breeders. Litters are absolutely minefields for trying to keep all puppies solid, and little bugs and germs sweep round them in those last couple of weeks from 6 – 8 weeks old, and sometimes the new owners end up ‘mopping up’ the last dregs of one of those bugs. In that case usually getting the puppy AWAY from the circulating germ at the breeders is enough to put things right. but imagine coupling THAT with the massive change that the puppy is experiencing, its not suprising days 1 – 4 or 5 are a bit of a minefield for many puppy buyers. OK, the second danger zone, for the puppy who comes home doing solid poo’s for the first few days is their next wormer. I would always recommend you space out the puppy vaccinations and the puppy wormer by a week… so lets say week 8 first jab, week 9 wormer, week 10 second jab, week 11 wormer (then for ME week 12 microchip – but thats just a personal schedule). Putting TWO lots of chemicals into a pups bloodstream in the same few days, or often the same DAY is a recipie to upset the strongest little body. So, a truly hugely common senario is you have a smashing pup, all is going perfectly well, puppy is happy eating the food the breeder used or that you, for various reasons, have switched them to. They are pooing solidly, they may even have no effects from their first vaccination… maybe even their first wormer after coming home…. then suddenly…. about week 10/11/12…. swwwwoooosh….. loose poo. The first couple of times its just loose… then suddenly its got little traces of blood in it, and possibly funny mucus stuff. Your Puppy has shot up, so suddenly they look lean, a bit ribby, and not nicely covered like they *did*. Possibly coupled with them starting to be being picky at mealtimes maybe, OR eat well but within 10 – 20 mins its shooting out the other end. You brace yourself when they crouch to poo, hoping it *just* might be solid…. I’ve even put my fingers in my ears praying not to hear that ‘squuuuirt – fire hydrant’ noise… but it happens… and you are GUTTED! You have broken your perfect puppy! it was all going SO well!! I’m going to list what WE do at this point…. but this is a list that has been formed from years of going to the vet and working through these stages over and over again until there is simply no need. HOWEVER AT ANY POINT THE PUPPY SEEMS DULL LISTLESS, IS SICK MORE THAN ONCE, LACKING ENERGY OR DOES NOT EAT FOR MORE THAN 2 MEALS IN A ROW PLEASE DO GO TO THE VET - even if you decide this info is helpful and start to follow it. 1) I always have in a wonderful thing called PRO-FIBRE GRANULES for dogs. Its about £12 a large tub (800gms) and is a probiotic. Its granules form of the tube of tummy medicine the vet will sell you Usually called prokolin or Diarsanyl). 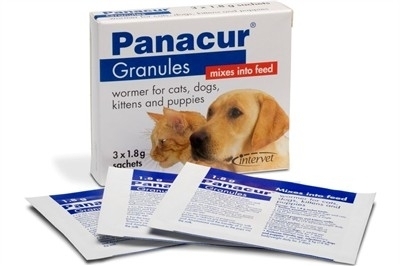 The granules tend to be very paletable, and you would get a months doseage in one tub unlike the vets tube of paste that lasts about three days if that. I would as soon as it arrives use a heaped scoop from the tub once a day in their food…. from the first sign of upset till it is well passed. 2) So the first thing the vet will do, is tell you to go home, and miss a couple of meals to empty the pups tummy out. THEN start on chicken and rice or something like that. Maybe scrambled eggs etc. This is a good first step to see if it works. For me, if I see THREE loose stool motions in a row (because any pup can have one squirty one then be perfectly fine) I kick into action. Personally I don’t bother with chicken and rice, I miss ONE meal, then give them a scrambled egg with LOADS of glucose powder whisked in and no milk. If you don’t have glucose powder a couple of teaspoons of white sugar is fine. I do this for two meals using a single egg each time. Only VERY bland treats are given at bedtime like a quarter of a plain bonio or possibly half a carrot. 3) I would then soak up HALF their normal kibble portion and the next meal give that….ditto the next meal. then I would assess… are they still squirty? Is it improving. Chances are if it IS either the portion you were feeding was too large for YOUR puppy (not someone elses – YOURS) or it was a little thing they ate. 4) Are they still squirting or loose (but happy to eat up)? OK, I would order from the internet Panacur granules. 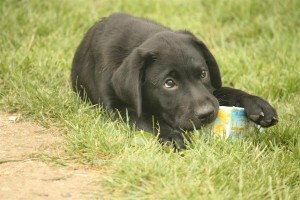 The sachets of 1.8gms (three in a box) are perfect for MOST 8 – 14 week old Labrador puppies. Meantime whilst this arrived I would be feeding them 4 x a day with about 3/4 per feed of what they were having when the squirts hit. I would be feeding them what they HAD been settled and perfectly OK on before this hit. If it was OK then, its NOT THE REASON this is happening NOW. Note: BLOOD IN THE STOOL, whilst not NORMAL, is not to be hugely concerned about at this stage because, frankly, its just the passage of poo shooting through somewhere that was not designed to be ‘shot through’…. little blood vessels burst, its not abnormal or indication of anything more serious than the fact they have not been poo’ing solidly for a few days…. it doesn’t make the reason for the problem any more or less serious than when there is loose poo and NO blood unless of course there is a LOT of it… a few drips or smears per stool is not to be concerned about. 5) When Mr Panacur arrives its one sachet in their food per day for 3 days. I would be continuing with the proFibre throughout. I would also be giving them a scoop of Probiotic plain natural yoghurt in their meal every other day to really try and sort that gut flora out at the same time. Two days after the Panacur has been given, the VAST majority of pups turn the corner. 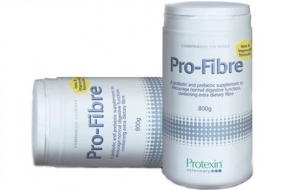 I would continue with the ProFibre even if they do for another week daily. 6) However if they do not, then at this point for me, it would be worth changing food. IF during this journey they have started refusing their food, it may be because they associate it with not feeling brilliantly top hole in themselves. And this ONCE I would listen to them and change. And frankly, if they have the squirts anyway, I would swap it overnight, rather than slowly as you would IF the puppy was poo’ing solidly …(but being honest with you, VERY few owners change food IF their puppy is happy and poo’ing solidly on it! Its usually the loose stomach of a pupy that makes the owner think they need to swap)… my priority is keeping them eating alongside being treated… but only the one change, not constant changes. This may need to happen the second they start the squirts if you had your doubts about their food at ALL…. or the point where you have done all you can with the above system. Vets will go the above route before anything else…. and its always worth DOING those steps before then taking it further. I have genuinely found the vet route of putting them on antibiotics works BRILLIANTLY…. for the duration of them being on antibiotics…. then they finish the course, and the old trouble is back. 7) If after starving, reducing food, using probiotics, using Panacur, switching food once, they are still having loose stools, then go to the vet. It probably will then be stool samples and antibiotics…. BUT the above is a tried and tested way to avoid that, for puppy and for you. It also means you won’t be turned away to do any of the above. you can go there having covered ALL the bases the vet would of charged you mucho to do… and you can go straight into stronger treatment and investigation.